Animals with Opinions: Breaking News- Moosey found!!!! say it isn't so moosey! apparently moosey has been riding the downward spiral to sleezeville. this photo was taken in mooseys' home three days ago. after verbally slandering the elk community he has entered rehab and is expected to give a public apology to elks everywhere. 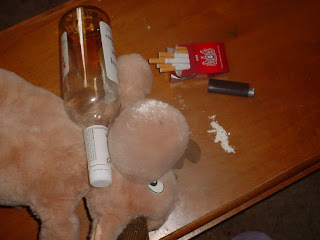 boy moosey you really mucked up!